Zune 4.5 update to be out soon, 64GB Zune HD? The Zune 4.5 firmware update will be out in the next few weeks. Microsoft confirmed some new features in the update which will include Smart DJ on Zune HD, Picks, music browsing and streaming from Zune marketplace on to your TV and will bring nativ XVID codec support on the device as well. Some interesting updates from Microsoft indicate that the player will soon be having native support for MPEG-4 and will play on your Zune HD dock or your HDTV. 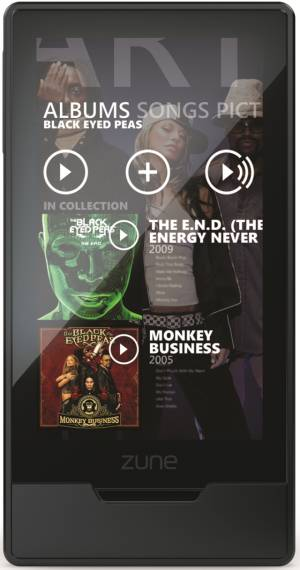 The Picks and Smart DJ features are coming to the Zune HD device as expected. Smart DJ makes it easy for users to create a new mix based on a database of selected songs and snippets. Users can download a collection of songs from their Zune Marketplace and use the Smart DJ to mix songs and this can also be done with a Zune pass subscription. With the new update, the Picks selection will be available directly to your Zune HD and also to your desktop Zune software. Picks analyzes what you listen and compares it to millions of similar tune recommendations so it can offer you many more choices of the same song or genre. With the new update you can now connect your Zune HD and not only watch videos but also browse and stream music from the marketplace directly. You can also browse your Picks playlist or also create and work on the Smart DJ. With support for MPEG-4, which includes Xvid and AVI support which was much awaited for long from the Zune users. Rumors are out that a 64 GB Zune will be out soon. Its just some time before we see a 64 GB Zune HD out at the same time as the Zune 4.5 update is released.